Hospitality workers from Local 217 Unite Here are hitting the picket lines across Connecticut this summer in solidarity with their coworkers waging contract fights at hotels in Hartford, New Haven, and Stamford. At a time when most unions are making concessions to the bosses, Local 217 has drawn a line in the sand. They are not only defending good contracts like a victory at CCSU this past spring, but also organizing new workplaces to grow the labor movement in Connecticut and build a class-struggle left wing to take on the bosses. In Stamford, Local 217 has waged a dynamic struggle to organize the Hilton Hotel. 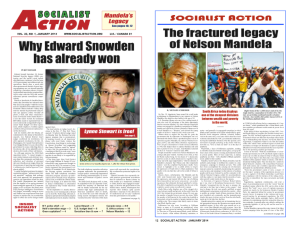 Socialist Action carried extensive coverage of the rank-and-file organizing drive that resulted in a victory, 110 in favor and 5 opposed. Today, the workers at the Stamford Hilton need the solidarity of the broader labor movement, students, and activists everywhere as they fight for a good contract. The hotel corporation Atrium has dragged its feet in negotiations. Atrium is trying to short change workers whom they have exploited for years through poverty wages and poor health benefits. Following a 40-hour week plus two other jobs, Hilton housekeeper Rosemene, like other Atrium workers, has taken home negative paychecks after health insurance is taken out. Two months ago, the Hilton workers called for a boycott of their own hotel until a fair contract is reached. Rank-and-file militants from the Hilton are driving the boycott forward by sending delegations of workers to companies and groups that have contracts or upcoming events with the hotel. Fred Linck, Socialist Action’s candidate for U.S. Senate from Connecticut, joins the Stamford Hilton hotel picket line. Fred’s campaign is calling on workers and students across Connecticut to stand in solidarity with the Hilton workers. A picket line was set up outside the Stamford Hilton on July 8. Banging pots and pans and carrying a giant boycott banner, workers demanded that guests take their business elsewhere. Jews for Racial and Economic Justice and the Jewish Labor Committee joined the picket line to call on the many Jewish organizations that frequent the Hilton hotel to join the boycott. Recently, the United Methodist Church in Connecticut has agreed to honor the boycott and cancel future events until the workers have a good contract. Also, the Ironworkers union in New York has agreed to help out on the picket lines. We ask our readers to support the boycott of the Stamford Hilton Hotel, and more importantly, join the workers on the picket line. You can search for Local 217 on Facebook to find details about upcoming actions. ← Where is Mexico heading with Lopez Obrador?